6 December 2016, at 12:00a.m. 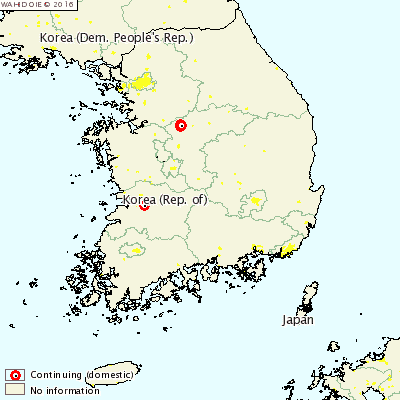 SOUTH KOREA - Six more farms have been affected by outbreaks of H5N6 highly pathogenic avian influenza in South Korea. This is a different strain of bird flu to the H5N8 type currently causing problems in Europe, India and the Middle East. The six farms recently confirmed with the disease in South Korea included one duck farm and five others with birds that were not identified in the country's report to the World Organisation for Animal Health (OIE). Over 53,000 birds were destroyed as a result of the outbreaks.